Petrohue is a small settlement in the Vicente Pérez Rosales Nacional Park in the Chilean Los Lagos (lakes) region. I found little documentation in English and few maps online on walking in the area so this blog post is an attempt to address it. 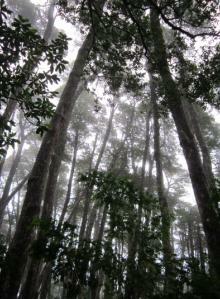 It is located on the southern flank of Volcan Osorno (Mt. 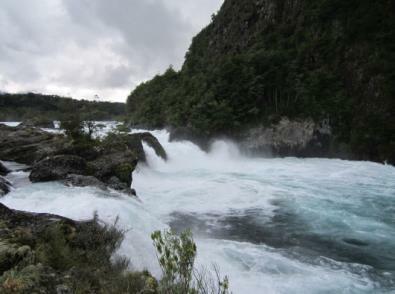 Osorno) and on the western shore of Lago (Lake) Todos los Santos. It is the ferry terminus of Ruta (Route) 225 to Bariloche in Argentina. Petrohue Lodge provides hotel accommodation. They can also arrange guided treks and boat trips. There are cabins which can be booked through the Lodge. 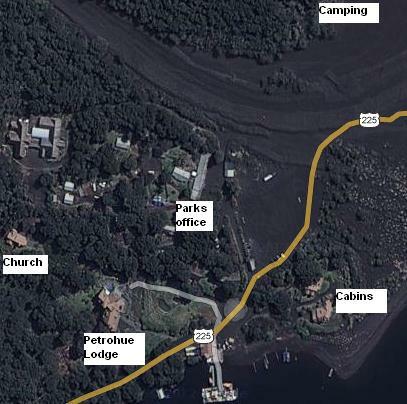 There is camping looking onto the beach, follow the road through to the left. There is no surface water except on the highest slopes so carry adequate water. 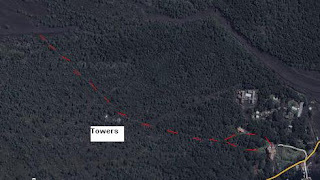 Follow the track behind the Lodge, past the church, veer right at the phone towers and climb over the levee to enter the ash plain. Note where you entered the ash plain, nearly the left end of the levee, you can use the phone towers as a guide when you return. Walk around till you get bored, 1-4 hours, and return the way you came. 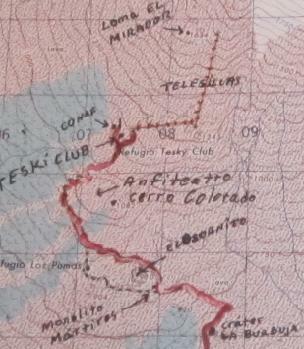 Alternatively the Sendero (Trail) Paso Desolacion passes very close to the eastern edge of the ash plain in places. Though its tempting to walk to the road on the southern boundary, there is a cliff in places. Follow the road round to just before the camping ground. The start is well signposted. The trail follows the east edge of the ash plain, at this point it is well marked. It crosses two large washouts, then the climb begins. 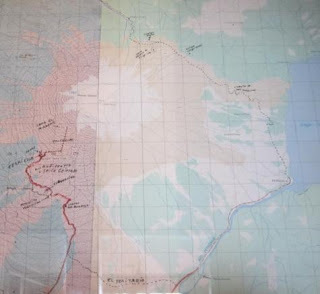 Shortly into the climb, the trail becomes poorly marked and braided but the parallel trails seem to join again. The trail runs through the saddle between Osorno and Picada peaks. 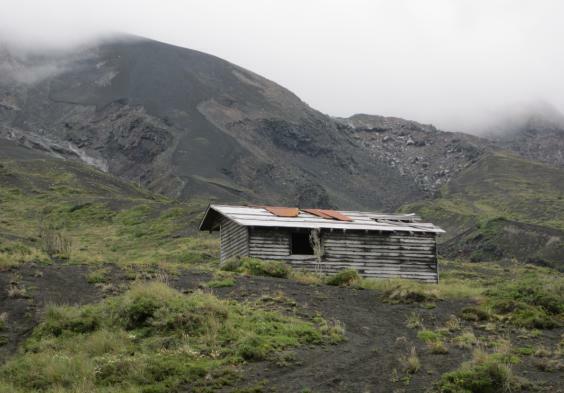 There is a derelict hut just past the saddle. The track turns back into a 4WD track and I was told there was a Conaf (parks service) refugio somewhere down the other side. 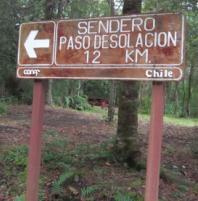 Get dropped off on the road to the Osorno ski resort at the start of Sendero Solitario. The start of the track is well marked. 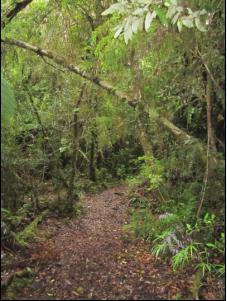 The start of the trail is an excellent dense forest of Northophagus and bamboo, later it passes through ash plain. It is well marked and takes 1.5 to 2 hours. It hits Ruta 225 a couple of km west of Salto del Petrohue (Petrohue falls). Walk east along the road to the falls. The entry fee of a few dollars is worthwhile. There is quite a network of trails, allow one hour. 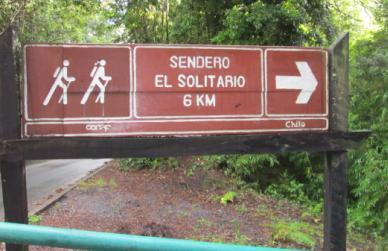 There is also a good interpretive nature trail, turn right across the bridge, but the signage is only in Spanish. The jet boat tour didn't look worth taking. The kiosk sells coffee, empanadas etc. , buy lunch here. 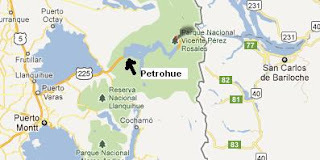 Then walk a few kilometers east along the road to Petrohue. The road runs parallel to the river so you can get free views of the rapids as you walk back. A couple of kilometers down the road from Osorno ski resort. Passes through high grade forest, then turns left up a washout. At the top turn right. I think it takes you to a lookout on a cinder cone but it was foggy and raining so I am not sure. I lived a year in a rent apartments in buenos aires and I traveled a lot to the Patagonia and the South of Chile. This is a great area to make trekking and it has many virgin views. I think that this should be one of the most beautiful places, and in relation with prices and safety is a great option for go on holidays! !